More states are legalizing the use of medical marijuana every year, and the growing of dispensary-grade marijuana has already blossomed into a billion dollar industry. More entrepreneurs are getting in on this bonanza every month, so now is the time to get in on the ground floor. Whether you're a current medical equipment supplier who would like to expand your niche in the marketplace or you're a grower who would like to become a trusted supplier of racks, reflectors and other medical marijuana equipment to other growers, American Quality Manufacturing has the capability to bring your concepts to fruition. Already have a solid customer base, but need to expand your production facilities? American Quality Manufacturing can take on your additional contract manufacturing needs so that you don't have to turn away new customers. We're uniquely placed to meet all of your medical marijuana equipment manufacturing needs. Because of our years of indoor lighting experience with indoor tanning systems, we can help you maximize the potential of each light fixture in order to ensure that your customers will be satisfied with the quality, longevity and reliability of every piece of equipment they purchase from you. 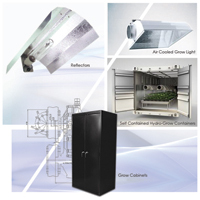 Have a great idea for an improvement on current medical marijuana processing equipment? Talk to our design team. They will work closely with you to take that innovative sketch or kernel of an idea from concept to prototype to actual production without ever compromising your intellectual property. We can work with you to design, manufacture, package and ship the appropriate equipment to your own warehouse or directly to your customers. If you're looking for a custom metal fabrication company who can manufacture the heating and cooling systems, hydroponics, drying and storage systems needed for your customers' successful medical marijuana ventures, American Quality Manufacturing is your source for guaranteed, high quality medical marijuana equipment at a price that makes sense.